Internalization of nanoparticles into live cells closely correlates with their potential applications, functions and cytotoxicity. In this study, fluorescein isothiocyanate (FITC) or rhodamine B isothiocyanate (RITC) doped silica nanoparticles with four different diameters were prepared. Their average size and distribution was measured by transmission electron microscopy (TEM) and dynamic light scattering (DLS). The optical property and zeta potential in serum containing medium of the FITC-SiO2 nanoparticles were detected, revealing that they had good stability and negative surface charge of similar value. Flow cytometry found that the uptake behavior of the FITC-SiO2 nanoparticles was dependent on their size and concentration as well as culture time. The particles mainly distributed inside the cytoplasms and endosomes, and on the cell membranes. Transportation of the silica nanoparticles into the cells was energy dependent via a clathrin-mediated endocytosis pathway, which was proved by an obvious decrease of the cellular uptake under a low temperature incubation, and NaN3, sucrose and amandatine-HCl treatments. 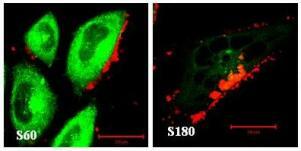 The impact of silica nanoparticles on the HepG2 cells was assayed in terms of cytotoxicity and cell cycle as well, revealing that they had little influence on cytotoxicity even at a high particle concentration of 680 µg/ml, and no influence on the DNA synthesis at a particle dosage of 80 µg/ml for 24 h. Cellular exocytosis of the FITC-SiO2 nanoparticles was confirmed after removal of the free particles from the culture medium, which was governed by the particle size and pretreatment time too.